You will not believe how much time you’ll save by using digital E-Stickers. Our customers not only rave about the time savings they experience, but they also love the fact that they save hard costs too in not having to rescan, reprint or reattach their hand stickered exhibits. 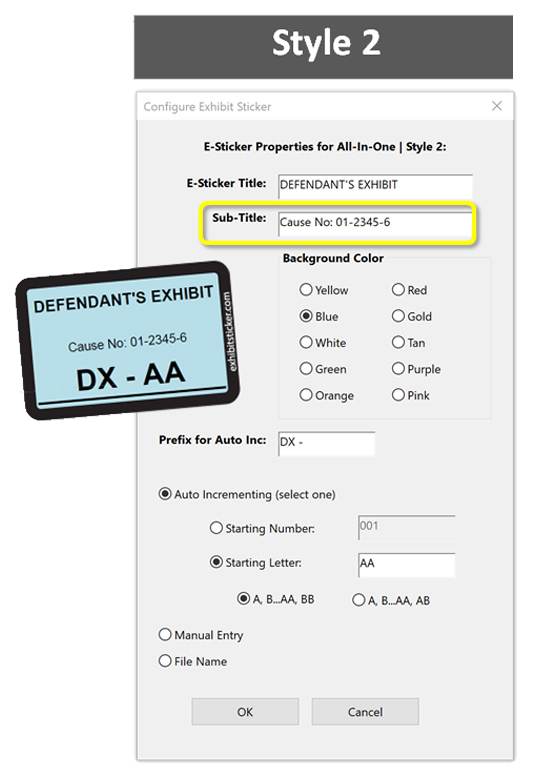 Our E-Stickers give your documents a clean and professional look as well. In addition, with the E-Sticker, you have unlimited E-Stickering abilities with this one purchase…no per sticker cost, no fee for outside services, no extra cost of stickering/re-scanning/re-printing. Your choices are almost limitless with these easy to use and easy to modify digital exhibit stickers. 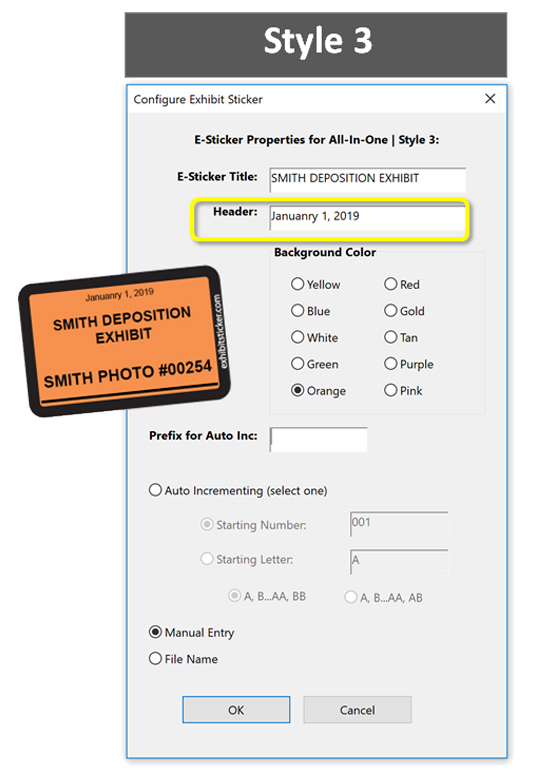 Simply type in the title to appear on your E-Sticker, select the color, set a prefix and select your starting number or letter. Every time you place your E-Sticker it will automatically increment to the next number or letter saving you valuable time. Our unique auto-incrementing feature remembers where you left off so you can easily return to your job and resume adding exhibit labels quickly and efficiently. 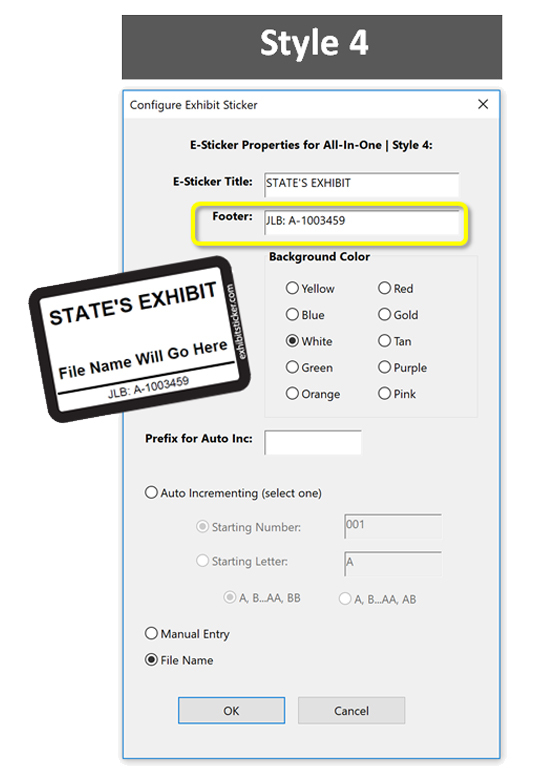 Our “Use File Name” feature is also unique and makes the process seamless if you have your documents already named by exhibit number. The E-Sticker Batcher (available upon request) will let you batch process a folder full of documents with one click. Compatible with Adobe Acrobat X, XI & DC (2015, 2017, 2019) and the free Adobe Acrobat Reader X or higher. 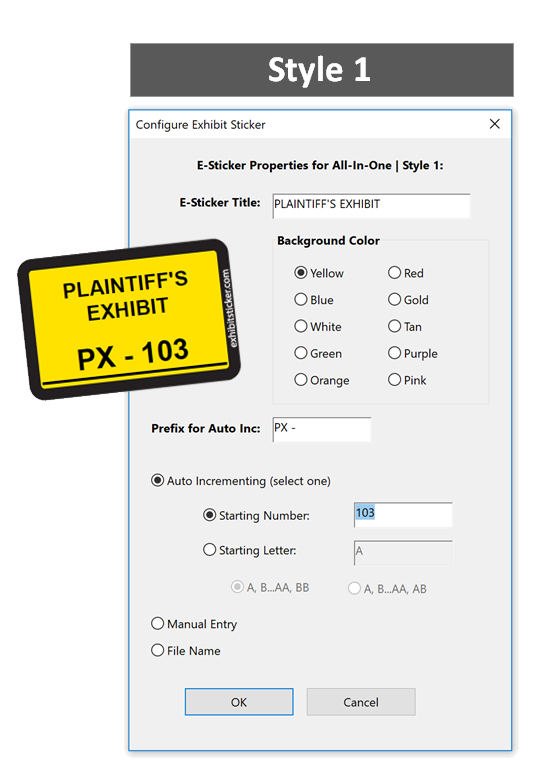 Windows: E-Stickers can be used with Adobe Acrobat Standard or Pro (versions X, XI or DC 2015 & 2017) and Adobe Reader XI or DC. Not supported for Adobe 9.0 or earlier versions. Mac: E-Stickers can be used with Adobe Pro (versions X, XI or DC) and Adobe Reader XI or DC 2015 & 2017 using Mac OS 10.5 or later. Not supported for Adobe 9.0 or earlier versions.